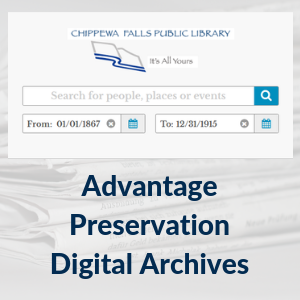 The Chippewa Falls Public Library collects and maintains information pertaining to Chippewa Falls and the surrounding area. As a service to those who cannot visit the library, library staff will perform limited research. Requests for photocopies of obituaries must state an exact death date, which includes date, month and year. Federal Census for 1840, 1850, 1860, 1870, 1880, 1890 (Civil War veterans only), 1900, 1910, 1920 and 1930. Bound indexes for the 1830, 1836,1838 and 1842 are located in the Wisconsin Archives. 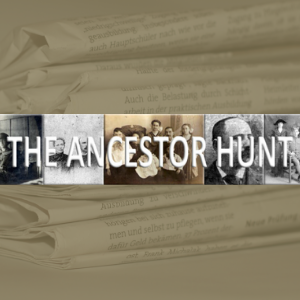 The Ancestor Hunt – contains over 40 million U.S. newspaper pages. Free. 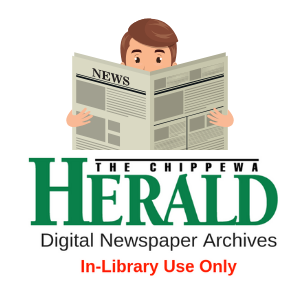 The collection of city directories for Chippewa Falls includes 1883, 1885, 1914, 1917 1920, 1923, 1926, 1929, 1934, 1937, 1940, 1943, 1945, 1948, 1950-51, 1952-53, 1955, 1956-57, 1958, 1959, 1961, 1962, 1963, 1965, 1967, 1969, 1971, 1972, 1974, 1975, 1976, 1977, 1979, 1981, 1982, 1983, 1984, 1985, 1986, 1987, 1988, 1989, 1990, 1991, 1993, 1994, 1996, 1997, 1998, 1999, 2000, 2001, 2002. The most current city directory is located at the Information Desk. The Library also has a few tri-county directories (Chippewa, Dunn & Eau Claire Counties, plus the city of Rice Lake). 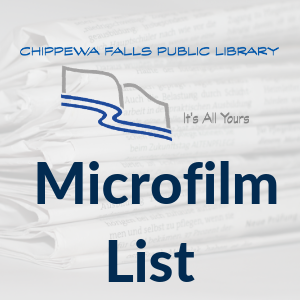 Wisconsin Counties on microfilm includes a 1888 Chippewa County platbook. Platbooks from 1920, 1930 and a 1945, 1961, 1966, 1972, 1975, 1977, 1979, 1981, 1984, 1986, 1989, 1991, 1993, 1995 and 1997 are located in the Wisconsin Archives. The most current platbook is shelved at the Information Desk. Copies of some of the local high school yearbooks for both the public and parochial school are housed in the Wisconsin Archives. Ancestry Libary Edition is available on any Internet computer at the Library. This collection showcases selections from the local history collections of 14 West-Central and Northwestern Wisconsin public libraries. These libraries, and many other Indianhead Federated Library System member libraries, serve as repositories for important local history documents. The Indianhead Federated Library System is comprised of 53 member public libraries in the region. The collection contains texts (including community records, local history narratives and retrospectives, high school yearbooks, and maps) and images of community sites, events, and residents. A remarkable collection of digitized historical photographs by Alfred A. Bish documents life in turn-of-the-20th-century Chippewa Falls, with particular attention to the area’s lumbering industry and the landscape of the region. Additional photos in the collection depict the area’s many mills and factories, as well as area residents posing for Bish’s cameras in his studio. The Wisconsin Historical Society’s collection contains 335 photos by Bish, including glass plates and original prints, with 150 of them now online. A place to discover and share your Wisconsin story. 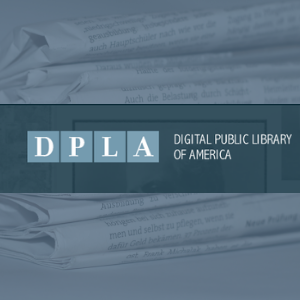 This website provides Wisconsin residents and audiences worldwide with free access to a growing set of historical resources from the collections of libraries, archives, museums and historical societies across the state. But this site is a place for more than just viewing digital resources. You’re also invited to contribute your own memories, images, knowledge and thoughts.